Saturday was sunny and cool, the perfect combination for autumn birding. I spent all morning at Jamaica Bay and had a great time (more on that tomorrow). Especially great was seeing twelve species of wood-warbler, one of my best days of wood-warbler watching all fall. Other than the hordes of Yellow-rumped Warblers that have returned to the city now that their breeding season is done and the well-named Common Yellowthroats the wood-warbler that was most prevalent was the Black-throated Blue Warbler. I saw three males and three females, and while no one will ever question a birder who stops for a second (or third or fourth) look at a male BTB the females are, well, rather bland. Nonetheless, one female Black-throated Blue Warbler certainly caught my attention when she came in close and let me photograph her in a variety of poses. Sure, her subtle coloration is no match for the gaudy male, but she is beautiful anyway, no? The one field mark that stands out that she shares with the male is the white “handkerchief” on her wing. And watching her watching the underside of a leaf until she suddenly lunged for a juicy tidbit, well, what other word but wonderful can I use? What’s that you say? You want a close-up? How about a shot of the undertail? Great pictures as usual. A few environmental groups like Nature Conservancy and National Wildlife Federation have photo contests, you should submit some photos. This fall seems to be a good one for black-throated blue warblers. I’ve been seeing lots of them. I remember a female Black-throated Blue that gave me fits trying to figure out what she was in Cuba. I doubt now that I’ll ever forget that “handkerchief”. As usual, a great post. 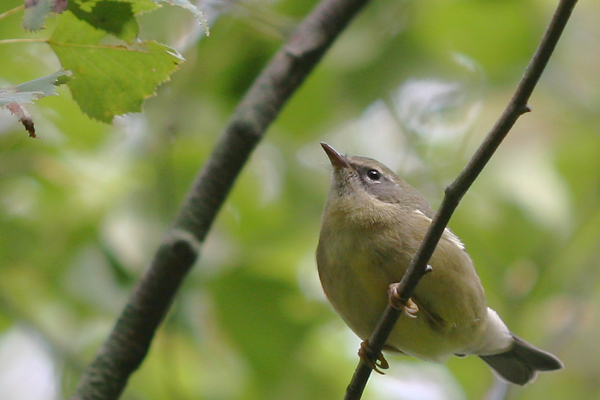 I think it’s awesome that you saw 12 species of wood-warblers in one day. That’s just unbelievable! Today I spent the day birding and the only migratory warblers I saw were the American Redstart, Northern Wathertrush and a lot of Prairie Warblers. 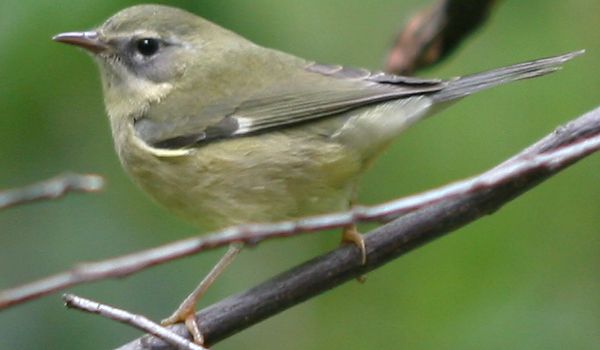 I also saw some others which are native such as the Bananaquit, the Yellow Warbler and the endemic Adelaide’s Warbler. Yesterday I spent the day in a forest were last year I saw a bunch of Black-throated Blues and don’t even saw one. 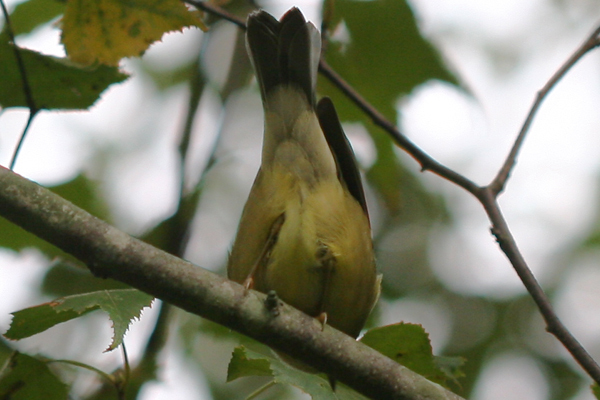 I saw the Northern Parula, Black-and-white and American Redstart though. 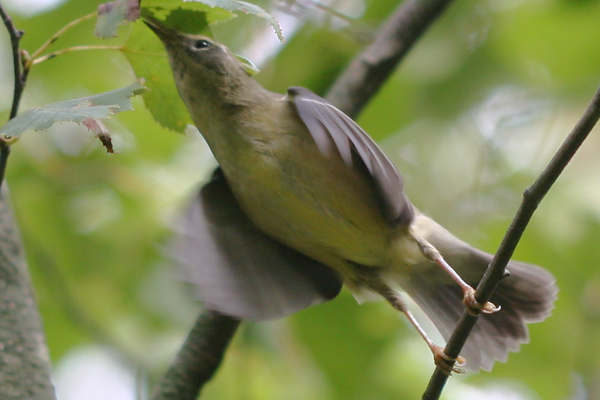 It’s too early for us in the Eastern Caribbean to see more than 10 warbler species in a trip. Here in PR the best is still to come! I hope! @Joseph: Thanks, and I’ve been seeing a ton of them as well. @Clare: Even more fun are the first-year females that sometimes lack the handkerchief altogether! @Hector: Thanks! On Sunday I had 15…but I’d trade all fifteen for a Bananaquit or an Adelaide’s!